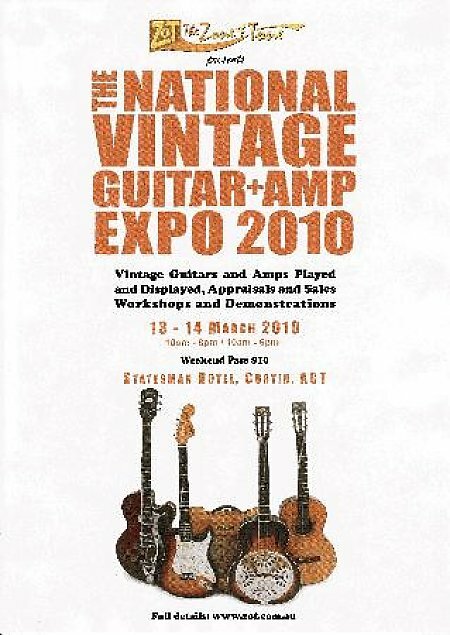 Australia's National Vintage Guitar and Amp Expo is being held in Canberra over the weekend of 13 and 14 march, 2010. It will be held at the Statesman Hotel in Curtin and will feature vintage guitars and amps. These will be displayed and can be played. Many will be for sale. The Expo will also offer appraisals of instruments, workshops and demonstrations. A weekend pass costs just $10. The Expo is presented by ZOT - The Zone of Tone - the well known vintage guitar and amp dealer. Ian ' Dr Zot' Stehlik said, "Following the success of the inuagural 2009 event, we'll be gathering lots of great vintage and rare guitars, basses, amps and accessories for the 2010 National Vintage Guitar Expo at the Statesman Hotel, Curtin, ACT on Sat 13 March from 10:00am to 8:00pm and Sunday 14 March from 10:00am to 6:00pm. Several exhibitors from around Australia will join us for a big room full of guitars and amps, including Global Vintage from Sydney, Twangcentral from Adelaide, Skip Sail from Victoria plus the usual suspects from Canberra!" Go to Dr Zot at www.zot.com.au for more news and detail.